Gov. Bill Walker on Tuesday announced that Jahna Lindemuth, a civil practice attorney at the Anchorage law firm Dorsey & Whitney, will be Alaska's next attorney general. Lindemuth, listed as the partner-in-charge at Dorsey, replaces Craig Richards, Walker's former law partner, who resigned last week. Lindemuth has represented Cook Inlet Region Inc., the Native regional corporation for the Anchorage area, and worked on the Fairbanks Four case which successfully challenged the convictions of four men for a 1997 murder. She also was one of four attorneys recommended earlier this year by the Alaska Judicial Council for a vacancy on the Alaska Supreme Court. Walker selected Susan Carney in May in what he said Tuesday was a "close decision." Walker said he got to know Lindemuth during that process, and said she received an "amazing" level of recommendations. Walker said he was struck by Lindemuth's pro bono work in the Fairbanks Four case and her commitment to public service, as well as what she has accomplished in private practice. "In everything she has been involved in in her professional career she has sort of risen to the top in one way or another," Walker said. Lindemuth, 46, will take over the 550-employee Department of Law in early August, officials said. Major questions face the state, including the state's role in proposed development of the $55 billion Alaska LNG project. Lindemuth will be the state's second female attorney general. The first was Grace Schaible, who was appointed by Democratic Gov. Steve Cowper at the start of his term in 1987. Schaible resigned in 1989. Sen. Lesil McGuire, R-Anchorage and chair of the Senate Judiciary Committee, said she supports the selection of Lindemuth. 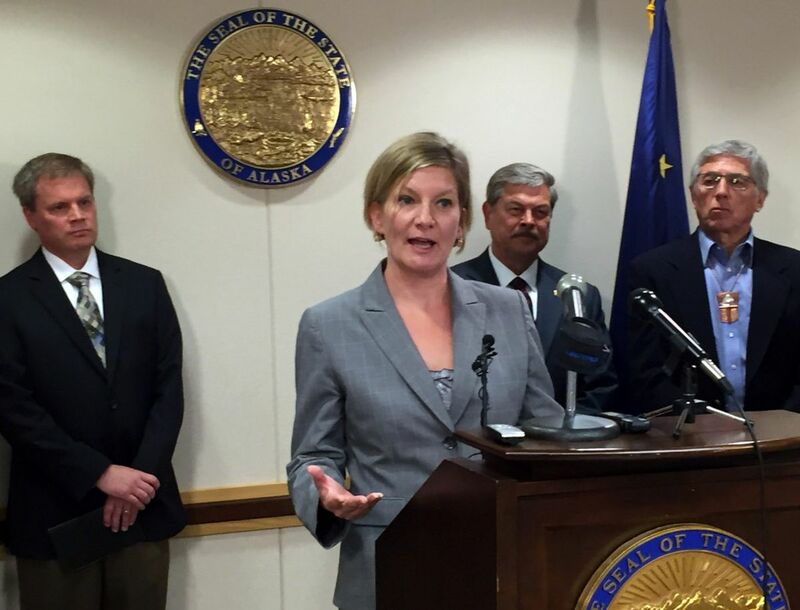 "She bring years of Alaska experience to bear on the legal challenges facing our great state," McGuire said. "With the Alaska LNG project, correction reforms, Arctic development and tribal sovereignty questions facing our state, I am confident Jahna Lindemuth will work for the best interests of all Alaskans." Lindemuth said she spoke with the governor about the position last week. She has not determined her policy goals, she said. The previous attorney general, Richards, 41, abruptly announced his resignation on Thursday effective immediately. He cited a desire to "re-focus" on his family. On May 31, Richards and his wife, Alyson, filed a petition in Anchorage Superior Court to dissolve their marriage but the matter has not been decided. Walker appointed Richards in December 2014. With degrees in finance and business as well as law, Richards also helped craft Walker's economic policies. Lindemuth said she faces a "steep learning curve coming from private practice" but said she'll work with the attorneys in the state Law Department to provide the best legal advice to the state possible. "It really comes down to providing the best legal advice to the state that I can," she said. "The way I approach this is the state is my new client and I am its lawyer and I have a great legal team behind me." A longtime private attorney in Alaska, Walker said he had a short list of attorneys that allowed him to name a quick replacement. Walker announced his selection of Lindemuth on Tuesday, in a press conference that included short statements from three other new commissioners in what's been a recent period of transition for the Walker cabinet. Walker announced the selection of Public Safety Commissioner Walt Monegan in April. In mid-June, Walker approved the appointment of Education Commissioner Michael Johnson. And on Thursday, Walker selected Andy Mack as his new Natural Resources commissioner, the same day Richards resigned. The Alaska Legislature must confirm the appointments.